You may or may not have heard in the past year that rice is high in arsenic. I’m not going to go into the details about it. 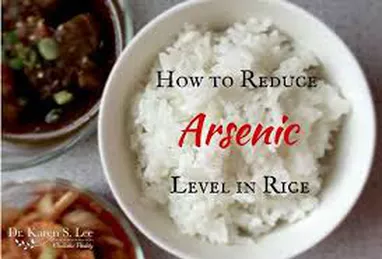 Instead I’m going to focus on how to remove arsenic from rice. Rinse your rice several times thoroughly in a strainer. Soak your rinsed rice over night in water before you cook it, to draw out the arsenic. Discard soaking water. California grown rice tends to be lower in arsenic than rice from other places. Precooked rice aka frozen, rice protein powders, rice crackers etc. are likely high in arsenic unless the company followed the above mentioned steps. But I wouldn’t count on that.